The composition of tissue fluid depends upon the exchanges between the cells in the biological tissue and the blood. The cytosol or intracellular fluid consists mostly of water, dissolved ions, small molecules, and large, water-soluble molecules (such as proteins). Enzymes in the cytosol are important for cellular metabolism. The extracellular fluid is mainly cations and anions. Plasma is mostly water and dissolved proteins, but also contains metabolic blood gasses, hormones, and glucose. The composition of transcellular fluid varies, but some of its main electrolytes include sodium ions, chloride ions, and bicarbonate ions. electrolyte: Any of the various ions (such as sodium or chloride) that regulate the electric charge on cells and the flow of water across their membranes. transcellular fluid: The portion of total body water contained within epithelial-lined spaces, such as the cerebrospinal fluid, and the fluid of the eyes and joints. ion: An atom or molecule in which the total number of electrons is not equal to the total number of protons, giving it a net positive or negative electrical charge. The composition of tissue fluid depends upon the exchanges between the cells in the biological tissue and the blood. This means that fluid composition varies between body compartments. The cytosol or intracellular fluid consists mostly of water, dissolved ions, small molecules, and large, water-soluble molecules (such as proteins). This mixture of small molecules is extraordinarily complex, as the variety of enzymes that are involved in cellular metabolism is immense. These enzymes are involved in the biochemical processes that sustain cells and activate or deactivate toxins. Most of the cytosol is water, which makes up about 70% of the total volume of a typical cell. The pH of the intracellular fluid is 7.4. The cell membrane separates cytosol from extracellular fluid, but can pass through the membrane via specialized channels and pumps during passive and active transport. The concentrations of the other ions in cytosol or intracellular fluid are quite different from those in extracellular fluid. The cytosol also contains much higher amounts of charged macromolecules, such as proteins and nucleic acids, than the outside of the cell. In contrast to extracellular fluid, cytosol has a high concentration of potassium ions and a low concentration of sodium ions. The reason for these specific sodium and potassium ion concentrations are Na+/K ATPase pumps that facilitate the active transport of these ions. These pumps transport ions against their concentration gradients to maintain the cytosol fluid composition of the ions. The extracellular fluid is mainly cations and anions. The cations include: sodium (Na+ = 136-145 mEq/L), potassium (K+ = 3.5-5.5 mEq/L) and calcium (Ca2+ = 8.4-10.5 mEq/L). Anions include: chloride ( mEq/L) and hydrogen carbonate (HCO3- 22-26 mM). These ions are important for water transport throughout the body. Plasma is mostly water (93% by volume) and contains dissolved proteins (the major proteins are fibrinogens, globulins, and albumins), glucose, clotting factors, mineral ions (Na+, Ca++, Mg++, HCO3- Cl- etc. ), hormones and carbon dioxide (plasma being the main medium for excretory product transportation). These dissolved substances are involved in many varied physiological processes, such as gas exchange, immune system function, and drug distribution throughout the body. Due to the varying locations of transcellular fluid, the composition changes dramatically. 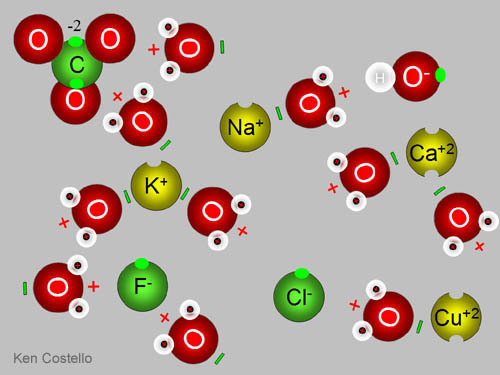 Some of the electrolytes present in the transcellular fluid are sodium ions, chloride ions, and bicarbonate ions. Cerebrospinal fluid is similar in composition to blood plasma, but lacks most proteins, such as albumins, because they are too large to pass through the blood–brain barrier. Ocular fluid in the eyes contrasts with cerebrospinal fluid by containing high concentrations of proteins, including antibodies.